This recipe is inspired by the Carbonara with Mama Lil’s Peppers on Michael Natkin’s delightfully-named vegetarian blog Herbivoracious (and check out his new Herbivoracious cookbook as well). I love Mama Lil’s Peppers and think they’re an inspired addition to pastas, pizzas, antipasto plates, and much more. (I even gave J a jar of the spicy ones as part of his Fathers Day present. But use the mild ones for this recipe!) A vegetarian carbonara is untraditional, of course–usually it gets a hit of smoky salt from bacon–and I departed from Michael’s departure from tradition by adding hot-smoked salmon instead. 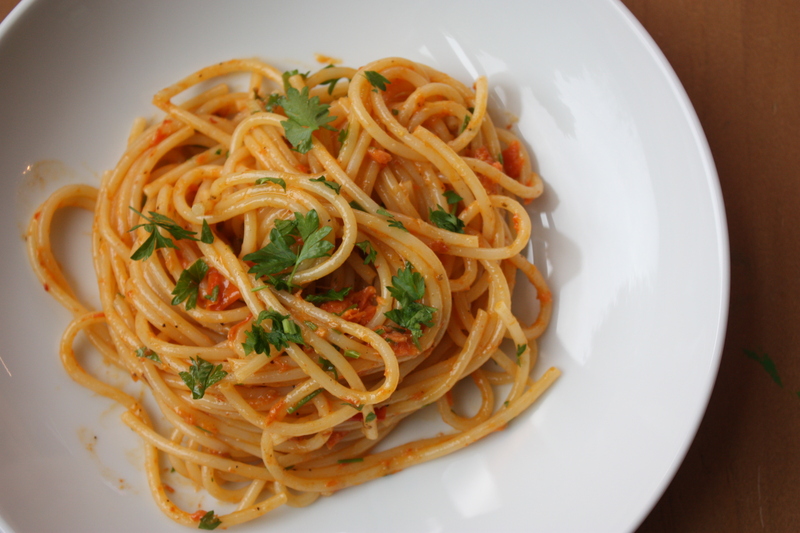 Smoked Salmon Spaghetti alla Carbonara with Spicy Peppers: Put a pot of spaghetti on to cook (we used about 3/4 lb. to serve four adults). While noodles are cooking, warm 1/2 c. Mama Lil’s mildly spicy peppers in a wide pan in some of their own oil (or, for a less-spicy version, drain them and use olive oil instead). Add a few thinly-sliced cloves of garlic to the peppers and simmer gently over medium-low heat. In a large bowl, beat 2 eggs with a few oz. finely-grated Parmesan cheese, a pinch of salt, and plenty of freshly-ground black pepper. When the noodles are almost ready, add flaked smoked salmon to the pepper-and-garlic pan and stir until warmed through. Drain pasta and add to the pan on the stove, tossing for a minute over the heat. Quickly scrape pasta into the bowl of eggs and toss thoroughly to combine. Add a handful of chopped parsley and toss again. I agree that it’s a good twist–I’m going to fake-carbonara all kinds of things this summer! This sounds wonderful! I love the fact like that “carbonara” doesn’t equal “bacon” here, as it often does on menus (I don’t eat bacon, but I love salmon). I didn’t know about tossing hot pasta in eggs — it sounds delicious and fulfilling. You teach me so much about real cooking, Emmy! I know that bacon has a ton of flavor but I don’t eat it either, so I’m interested in good substitutes–smoked salmon certainly is one, but I read somewhere else recently about using salty smoked almonds, and that sounds great too! Looks divine! I love the twist on carbonara. The photo is beautiful too! Thanks–it was a beautiful dish! Yes! I’m always interested in non-bacon ways to add salt and smoke flavors. I recently also read about using salty smoked almonds, which sounds great to me as well! My husband would really enjoy this version of carbonara as he loves smoked salmon. Great minds think alike! I did a vegetarian carbonara tonight too! Excited to try yours next. You are the best…thank you! Carbonara is one of my favourites… smoked salmon is a terrific idea. I love the colour of yours!